Designed and manufactured in the USA the SoM-9G45 is a System-on-Module (SOM) based on the Atmel ARM9 AT91SAM9G45 processor. 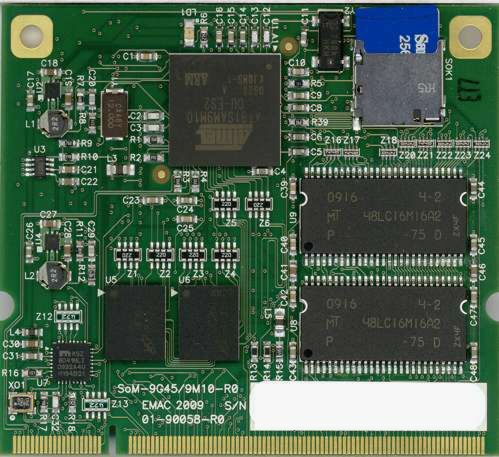 This Fanless ARM9, 400 MHz SoM has an Ethernet PHY included along with 4 serial ports. It utilizes up to 256MB of external DDR2 / SDRAM, 1GB of NAND Flash and includes an MMU which allows it to run Linux Operating System. 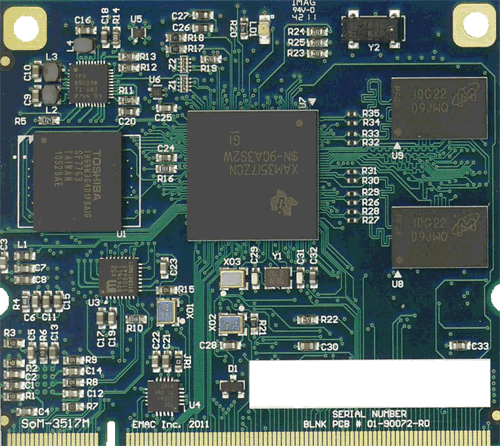 A SoM is a small embedded module that contains the core of a microprocessor system. SOM-5898 is equipped with Intel® 7th Generation Core™/ Xeon Product Family, which are manufactured on Intel 14nm process technology. SoM-4455 is low power consumption but high performance embedded ETX CPU module that enables customers to extend their system to ever more applications. This CPU module adopts the AMD generation Geode LX 800 series processor which offers a faster and more flexible display solution. The integrated graphic accelerator provides multiple display options: (CRT, LCD or CRT+LCD) without extra charge. For I/O, there is high speed USB 2.0 and two serial ports. Low power consumption makes it possible to save energy and make the system more reliable; all in a fanless design. SoM-4455 is low power consumption but high performance embedded ETX CPU module that enables customers to extend their system to ever more applications. This CPU module adopts the AMD generation Geode LX 800 series processor which offers a faster and more flexible display solution. The integrated graphic accelerator provides multiple display options: (CRT, LCD or CRT+LCD) without extra charge. For I/O, there is high speed USB 2.0 and two serial ports. Low power consumption makes it possible to save energy and make the system more reliable; all in a fanless design. All of these features make SoM-4455 the best choice for outdoor and highly reliable applications. SoM-4455 complies with the "Green Function" standard and supports doze, standby and suspend modes. 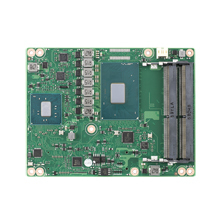 The small size board (95 mm x 114 mm) uses four high capacity connectors based on the proven SoM-ETX form factor, allowing SoM-ETX modules to be easily and securely mounted onto a customized solution board or our standard SOM-DB4400 development board. 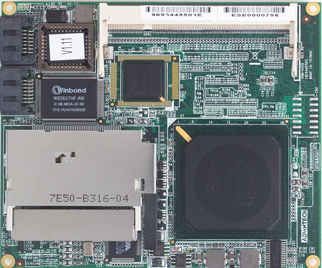 SoM-ETX is a standard CPU module with all the main components on board and connects to the customer’s own carrier board with 4 connectors. The customer can make the necessary designs on their own carrier board base. SoM-ETX not only significantly reduces development time but also keeps maximum design flexibility for satisfying different market demands. AMD Geode LX800 integrated 2D graphic controller. Share system memory up to 32 MB. CRT/LCD/LVDS.